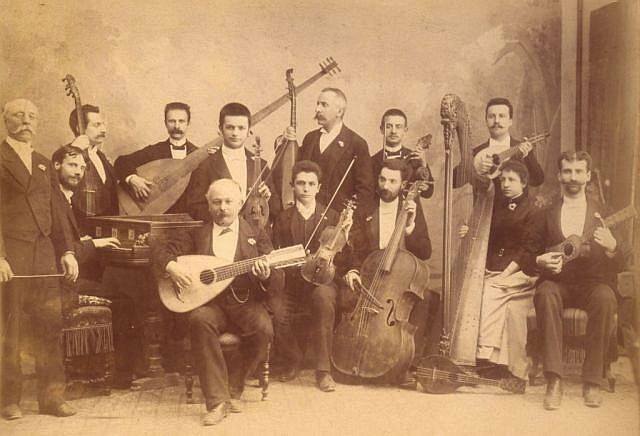 Concert by musicians of the Academy of Santa Cecilia, 24th May 1889. Musicians of the Academy of Santa Cecilia gave an inaugural concert on 24th May 1889 in the Palazzo Doria Pamphili Palestrina room, Piazza Navona, Rome. 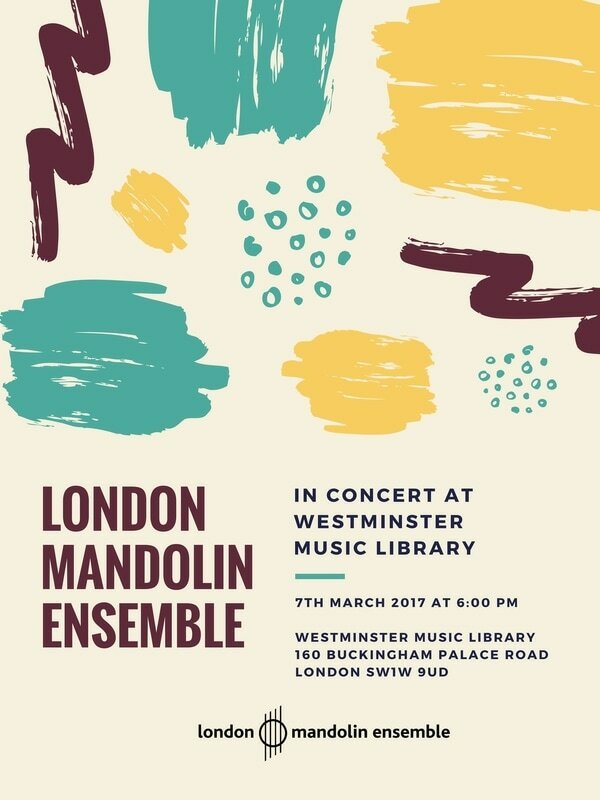 The concert was promoted by the Company Musicale Romana, and the programme consisted of Italian music from 17th to 19th century. The ensemble performed on period instruments, six of which were later acquired for the collection of the Academy of Santa Cecilia, where they still appear today. All the musicians wore a jewelled daisy in tribute to the Queen of Italy, Margherita di Savoia, who was present at the concert. 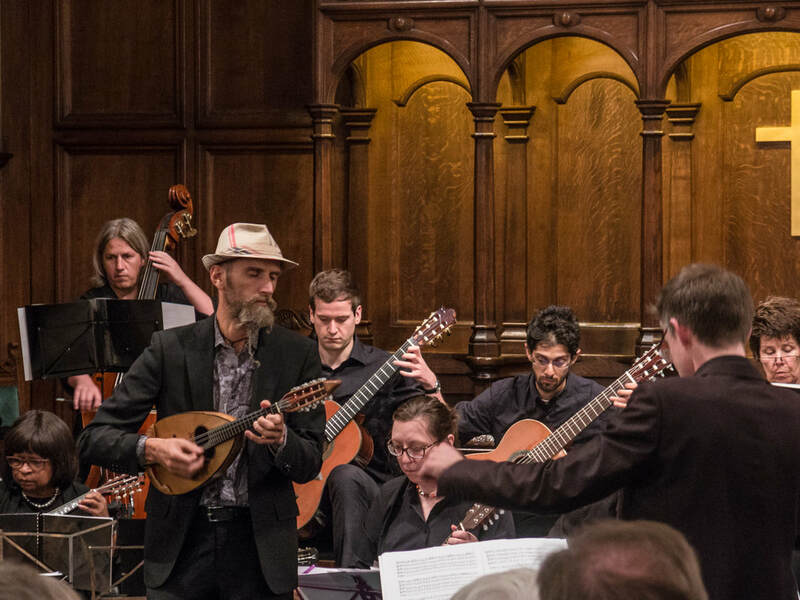 The ensemble's director, Alessandro Orsini, stands far left, and Giuseppe Branzoli, seated in the foreground, holds a mandolone. The other instruments in the collection are, from left to right: a harp guitar that one of the musicians in the background rests on the harpsichord; a rebec held by the young musician behind Branzoli; a violin made by Carolus Helmer in Prague in 1814; the cello labelled Francesco Framonti, 1688, and a viola da braccio built in Venice by Johannes Marcus Grapello, which can just be seen in the hands of the musician behind the cellist. 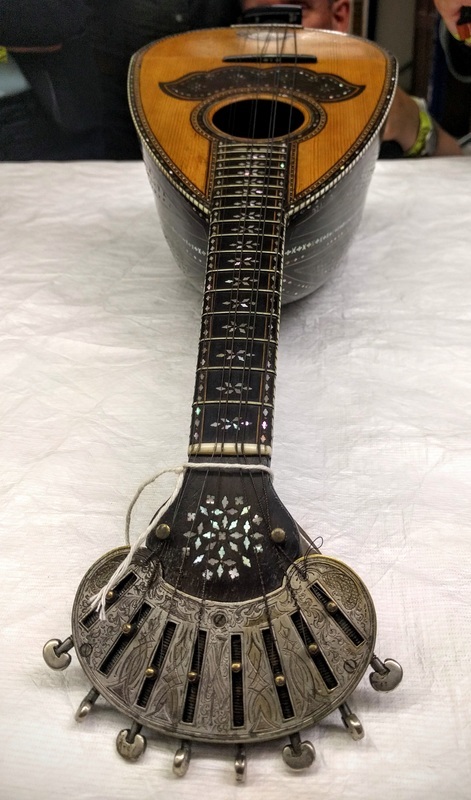 With the exception of the Helmer violin, these instruments were either donated or purchased in 1895, the year of the Museum's foundation. 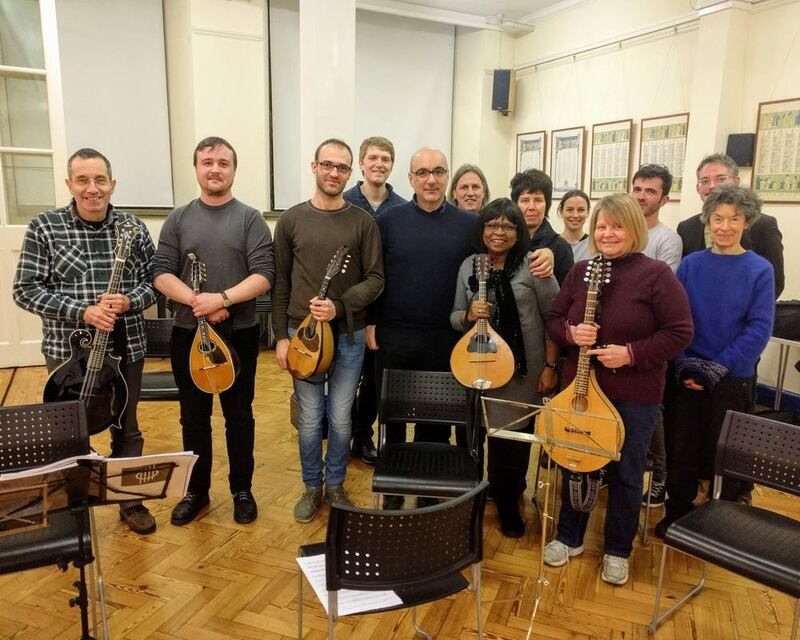 LME had a sparkling rehearsal earlier this month, when Mauro Squillante, professor of mandolin at Bari Conservatoire and Baroque music specialist, visited us in Covent Garden. 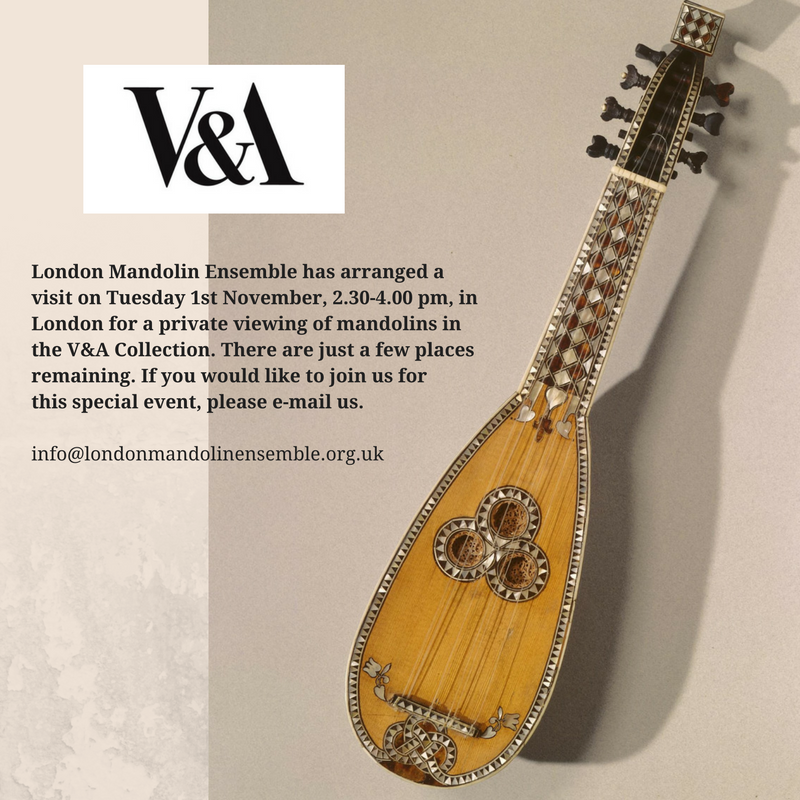 He was in London for The Lute Society's Historical Mandolins meeting which took place on 4th & 5th February. 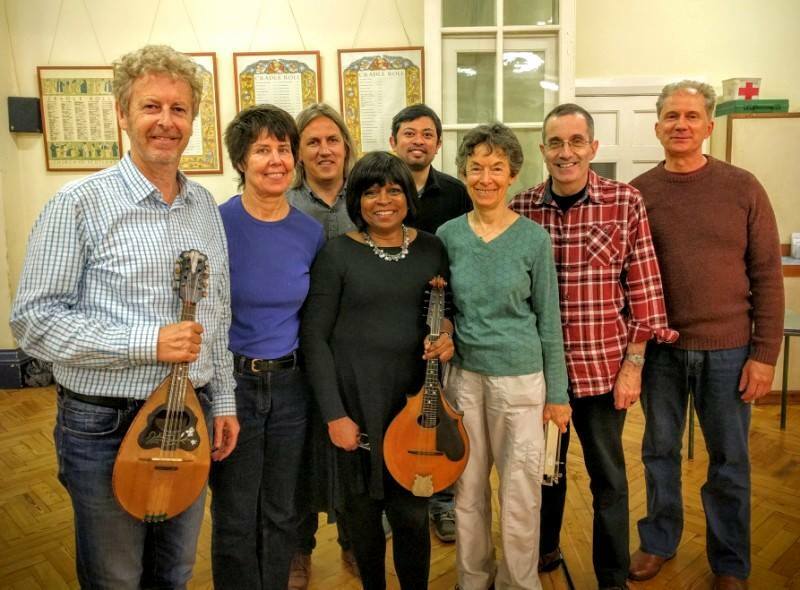 Another lovely rehearsal last Monday for LME. 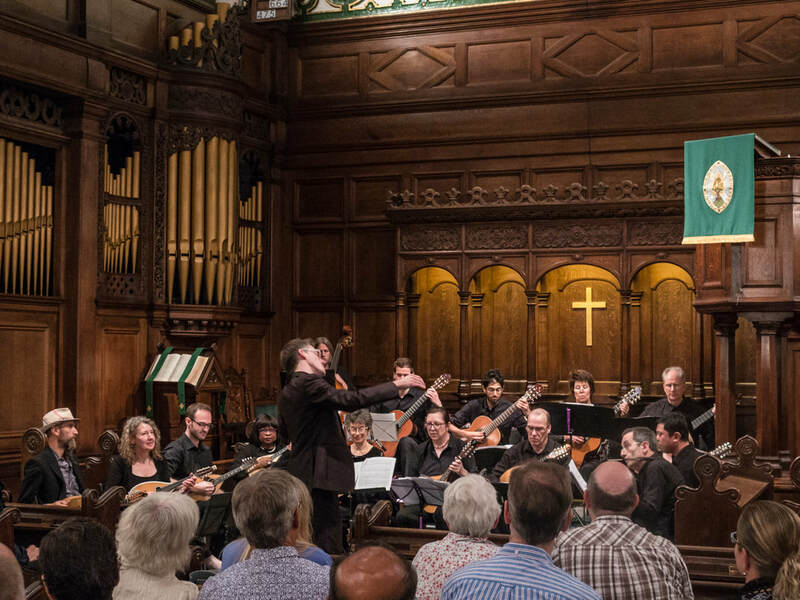 We were really delighted to meet Stephen Lalor, renowned Australian composer and plucked string specialist, who visited London with the Australian Chamber Orchestra for a series of concerts at Cadogan Hall. Carmelo Catania (1908-1970) was a Sicilian luthier who built his first string instrument (a harp guitar) at the young age of seventeen. 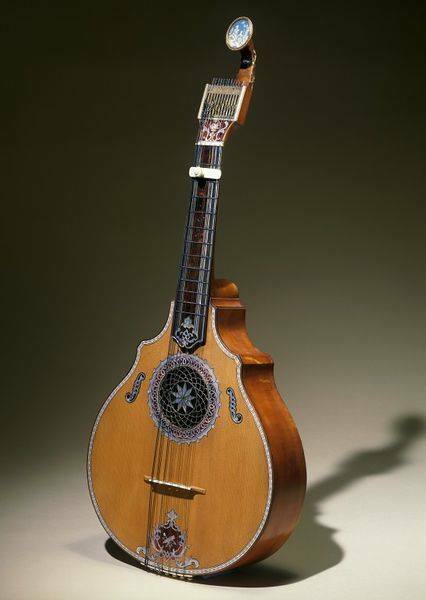 Luthiers in Sicily were always open to both the Baroque influence from Spain and to the innovations coming from Europe and the USA, and Catania became the first great star of Sicilian luthiery. 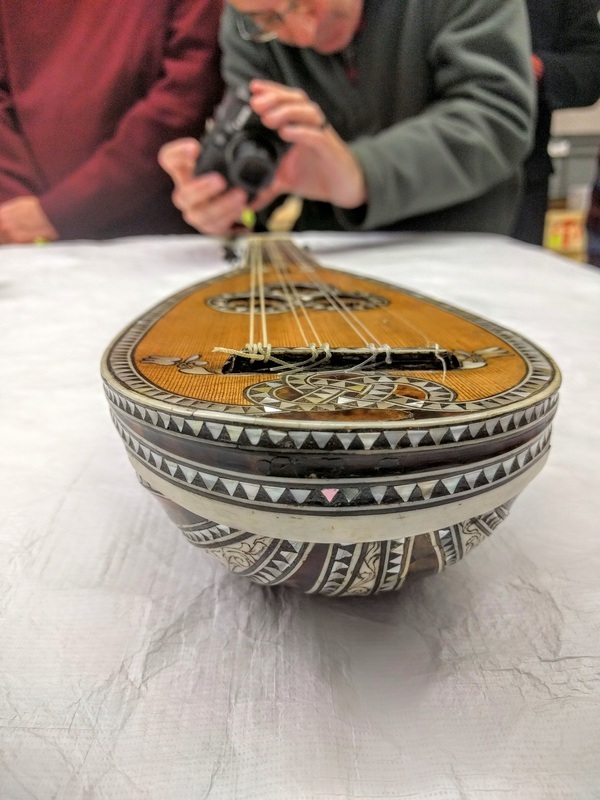 Catania started working on mandolins, learning the ropes of his trade very early in life in Naples, gleaning the secrets of the Neapolitan school of string instrument making and repair. At age 18, he went to Naples to work in Calace’s workshop. 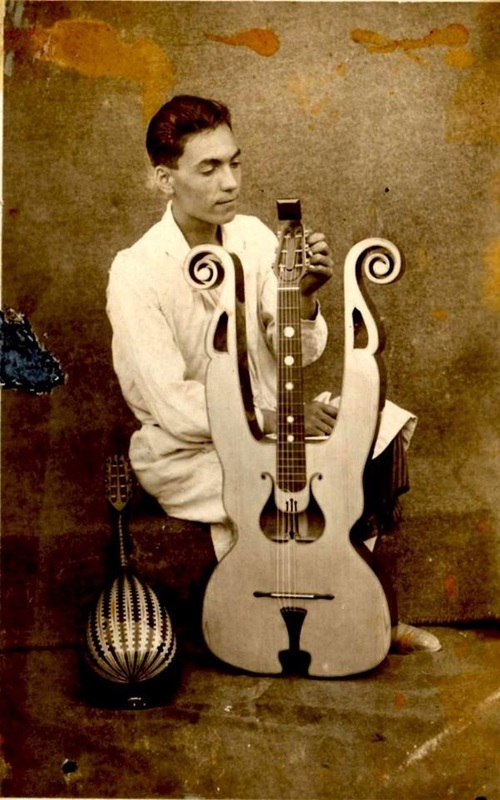 At age 20, he set up his own shop back in Catania, where he built his second, more elaborate, harp guitar that would become his company’s logo when his business was registered in 1936. In Rome he met luthier Luigi Embergher, and became influenced by the Roman school. 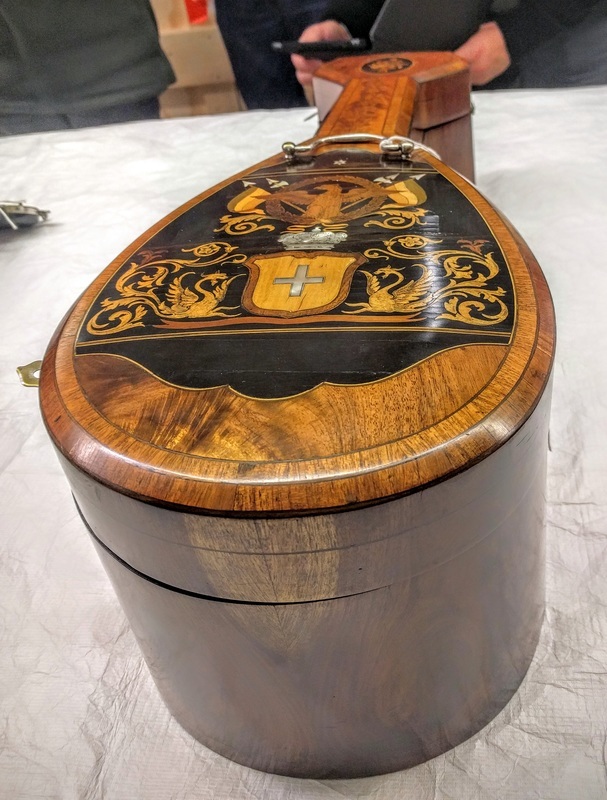 After the Second World War, the “Primaria Fabbrica di strumenti musicali a corda Carmelo Catania” recorded a sharp increase in business, peaking at 10,000 instruments sold a year, ranging from the professional to the beginner. 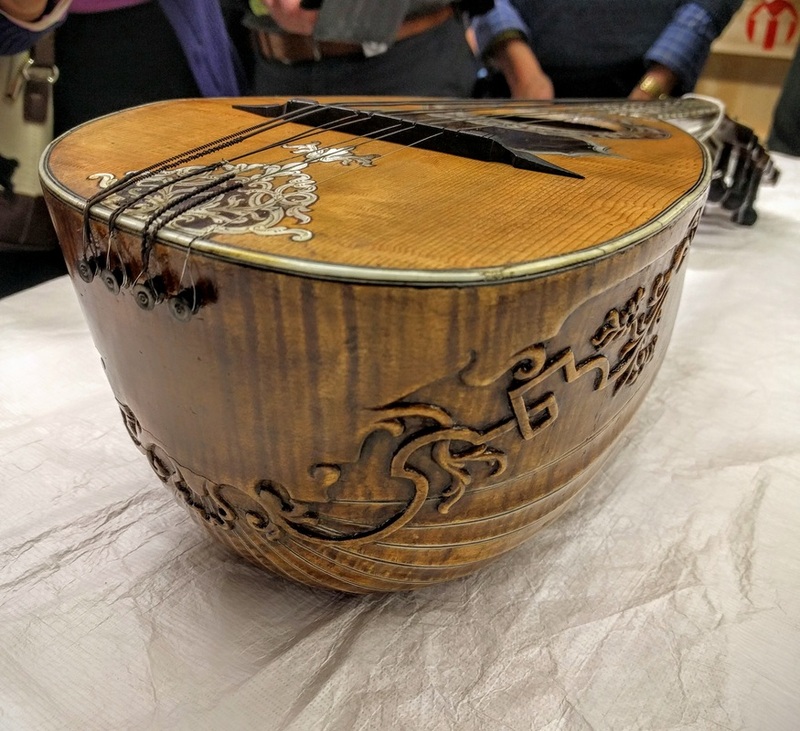 He produced an incredibly wide range of crafted instruments on an industrial scale in Sicily. Carmelo died in 1970. English guitar by da Silva, Jaco Vieira, made ca. 1780. Museum Number 208-1882. V&A Collection. 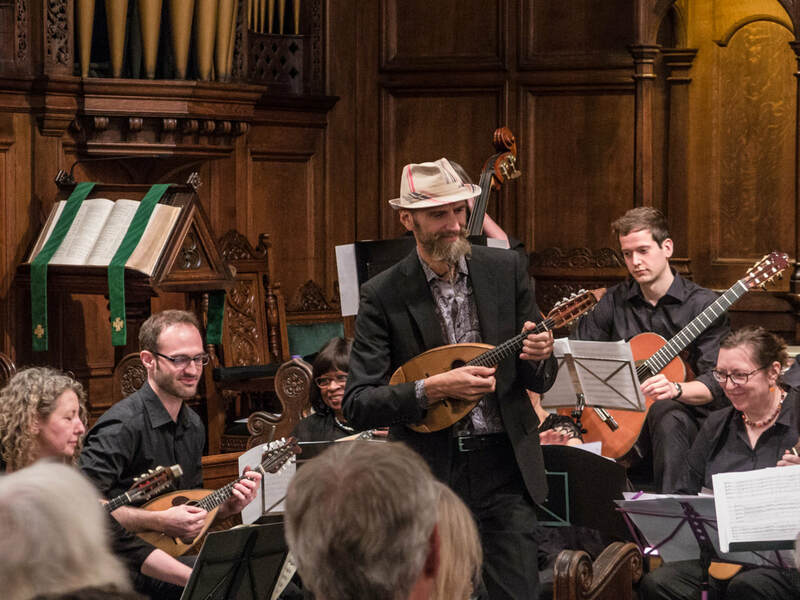 The English guitar was a fashionable instrument from about 1750, considered easy to play and tuned in C major, although the player would use a capo, much like a modern folk-guitarist, in order to change the key. The tuning pegs were often small metallic pins that could be turned with a watch-key, to keep the strings in tune longer. 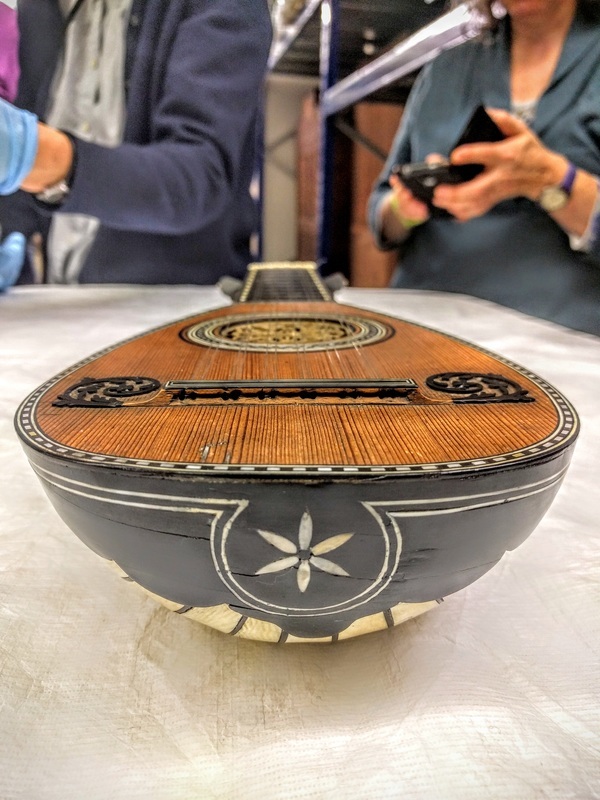 This instrument was made in Portugal, a country with strong trading links with England, and its peg box is decorated with a paper 'cameo' in imitation of a jasper ware medallion, a motif made popular by Josiah Wedgwood (1730-1795) from about 1770.